1.Preheat broiler. Coat a large baking sheet with nonstick spray; set aside. For filling: In a small bowl, stir together cream cheese and sugar until smooth. Set aside one-fourth of the chocolate. Finely chop the remaining chocolate; stir into cream cheese mixture. 2.Lay 10 of the wonton wrappers on a clean work surface. Spoon 1 tablespoon of the filling into the center of each wrapper. Lightly moisten the edges of each wonton wrapper with water. Top each with another wonton wrapper, pressing edges to seal. If desired, use a fluted pastry wheel to trim edges of each square. 3.Place squares on prepared baking sheet. Coat the tops of the squares with nonstick spray. Broil 4 to 5 inches from the heat about 2 minutes or until golden brown (do not turn). 4.Meanwhile, place the reserved milk chocolate in a small microwave-safe bowl. Microwave on 50 percent power (medium) for 1 minute. Stir until smooth. 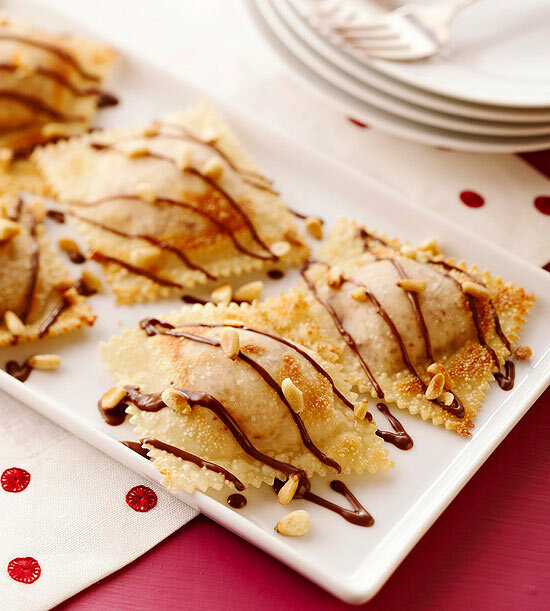 Drizzle melted chocolate over warm ravioli; sprinkle with pine nuts. Serve warm.